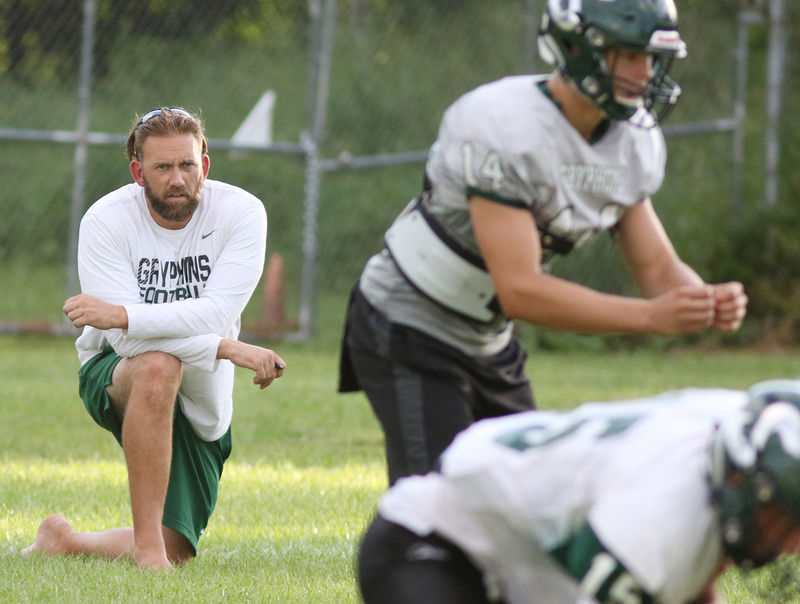 TAMPA — Sickles High football coach Patrick Murphy took off his shoes the other day and strolled barefoot over the spongy green grass during practice. "Sometimes we do things a little differently here," said Murphy, a big grin on his face and big green GRYPHONS FOOTBALL printed on his white T-shirt. "It works for us." So far in 2018, it's working well indeed. Sickles is 5-2 with its only losses to 6-0 Tampa Bay Tech and 5-1 Plant — both ranked high in the state poll. Big, bright Division I-A caliber stars? Not a one in the Sickles bunch. It's more like a slew of shiny lights that make for a pretty cool scene, particularly when they swarm. The defense is a perfect case in point with defensive lineman Nathan Covey, linebackers Brevin Hart, Kasey Califar and Brandon Davis and defensive backs Lucas Collins, Leo Guarton and Elijah Achecar — all of whom, except for Covey, weigh 185 pounds or less and stand no taller than 5-foot-10. Covey, by the way, stands in at a whopping 6-1, 225 pounds, which makes him the third heaviest player on the Gryphons' 50-man roster with only two other players listed at 255 and 260 pounds. That's why Sickles' swarms, gang tackles and has held opponents to an average of seven points a game. Even high-octane TBT and Plant only scored 19 and 21 points, respectively, on the relentless Gryphons. "It's the only way we can do it," Murphy said. "So that's what we do." It should also be noted that pretty much all the aforementioned players go full-time on offense, which unlike the defense, has sometimes struggled to find a rhythm. "But we're getting there," said Sickles senior center Don Brown, who has grown with Murphy during the coach's first three years. "We believe in what we're doing because we believe in Coach Murphy and we know we have to rely on each other to make it work. We know we can't rely on a superstar to get it done and I think we all like the idea of that. We know that each of us is important on every single play." Murphy says junior quarterback Joseph Sandorf has shown flashes of brilliance and could make a major breakthrough at any moment, which would be perfect if it came Friday night against Class 7A, District 8 arch-rival Gaither (4-3, 2-2). A Sickles victory would not only give the Gryphons a 4-1 district record but would put them in the driver's seat for a playoff berth. "All I know is that when we walk onto the field against anybody we feel prepared and confident," Brown said. "We will go in confident against Gaither." Brown said a great part of the confidence stems from good old-fashioned hard work, which has translated into every single player getting stronger, faster and smarter. "When I started three years ago with Coach Murphy I bench pressed about 115 pounds and squatted about 225 and now I've pretty much doubled those numbers," Brown said. "Coach told me when I was sophomore that if I stayed with it that my senior year would be the best of my life, and so far that is the truth. Coach Murphy sets the tone and we all love it. We all believe in it."